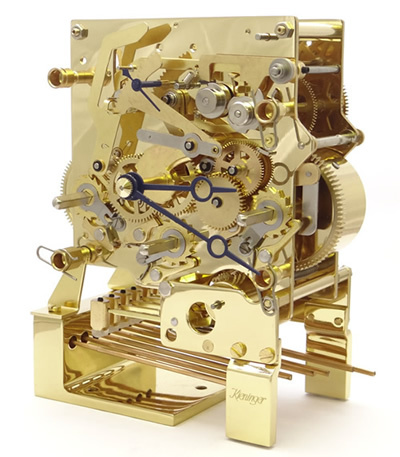 Kieninger Clock Movements - Please Note that parts on this page are only available by internet order - We are pleased to provide telephone or e-mail advice to clock makers but we cannot entertain visitors. 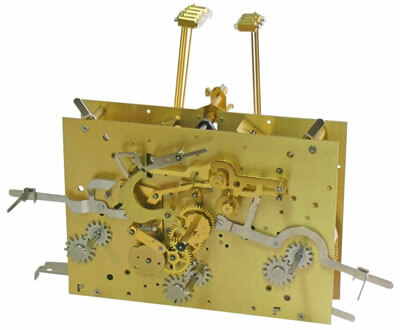 If you are building a clock we suggest that you visit our Kieninger Movement, Dial & Pendulum Sets page. 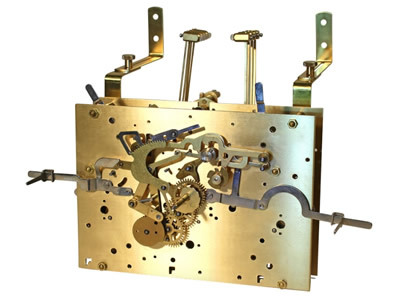 The movements on this page are supplied and priced as replacements for existing Kieninger and Howard Miller clocks - the price does not include the gongs, mounting brackets or the hands, we assume that you will transfer these items from your existing movement. If you do require these parts, they are available on our Dials, Pendulums, Accessories & Movement Repair Parts page. Please note that the photos of the movements are for general identification and they may show some features that are not included at the stated price! Oakside will ship movements World Wide - Please Contact Oakside for details. The Kieninger AEL 04, Westminster melody, Swiss Balance escapement movement. 4/4 key wind movement with escapement (2 jewels), Westminster chime on 5-rod gong and automatic night time shut-off between 10.00 PM and 7.15 AM. Supplied with the hammers as shown. An underslung gong assembly is listed as an option. Please note that we ship UK Tax Free to Canada, USA, Australia & New Zealand. Click here to view the AEL 04 movement Options and Prices page. The Kieninger LEG - Hour striking, Swiss Balance escapement movement. 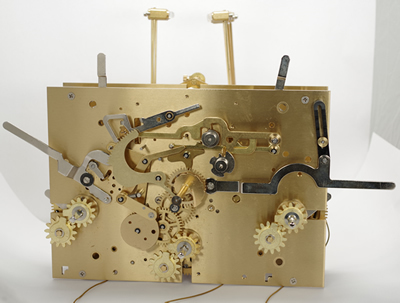 Key wind movement with escapement (5 jewels), Rear Mounted Brass Bell. Click here to view the LEG movement Options and Prices page. The Kieninger J 0212, Swiss Platform Chronometer Escapement with 11 jewels movement. This movement is the highly polished version. Rear Winding 1/4 key wind movement with Swiss Platform Chronometer Escapement with 11 jewels. Triple chime (Westminster, St. Michael & Whittington) play on an eight-rod 120mm gong. Plate size 100 x 104 x 2,0 mm, 6 bronze bushings (2nd wheel), spring barrel with removable axle, mantel clock version with Swiss escapement, chime shut-off. The hammers are part of the movement. The Polished Gong Assembly and Polished Legs and the hands, shown on the image are not included with the standard movement but they are available separately. Click here to view the JE Front Winding movement Options and Prices page. The Kieninger J 0208, Swiss Platform Chronometer Escapement with 11 jewels movement. This movement is the highly polished version. Click here to view the JE Rear Winding movement Options and Prices page. The Kieninger J 1210 - 29cm pendulum movement. Click here to view the JP 29cm movement Options and Prices page. The Kieninger J 1210 - 35cm pendulum movement. Click here to view the JP 35cm movement Options and Prices page. 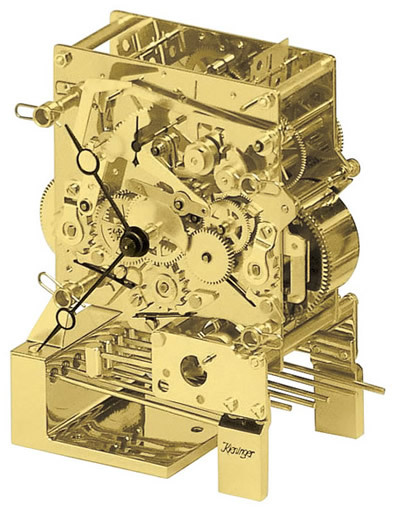 The Kieninger J 1210 - 43cm pendulum movement. Click here to view the JP 43cm movement Options and Prices page. The Kieninger J 1210 - 48cm pendulum movement. Click here to view the JP 48cm movement Options and Prices page. 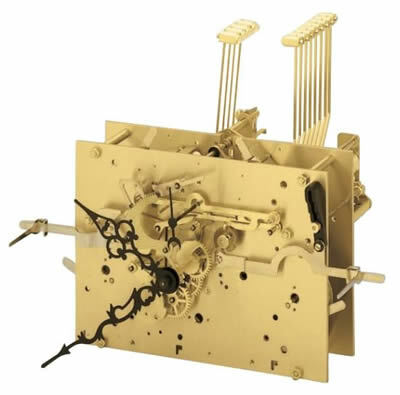 The Kieninger J 1210 - 54cm pendulum movement. Click here to view the JP 54cm movement Options and Prices page. The Kieninger J 1210 - 65cm pendulum movement. Click here to view the JP 65cm movement Options and Prices page. 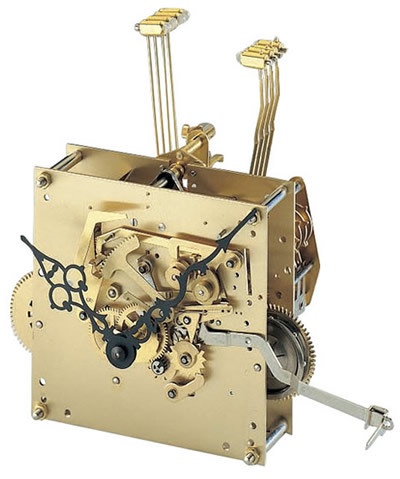 The Kieninger APL 05, Westminster melody, 29cm pendulum movement as shown but without hands. 4/4 key wind movement with dead beat escapement, Westminster chime on 5-rod gong and automatic night time shut-off between 10.00 PM and 7.15 AM. Supplied with the hammers as shown - the gongs are listed separately. Click here to view the APL 29cm movement Options and Prices page. 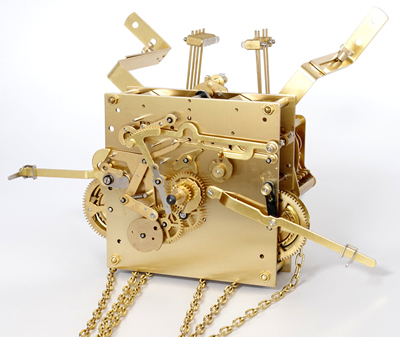 The Kieninger APL 05, Westminster melody, 35cm pendulum movement as shown but without hands. 4/4 key wind movement with dead beat escapement, Westminster chime on 5-rod gong and automatic night time shut-off between 10.00 PM and 7.15 AM. Click here to view the APL 35cm movement Options and Prices page. 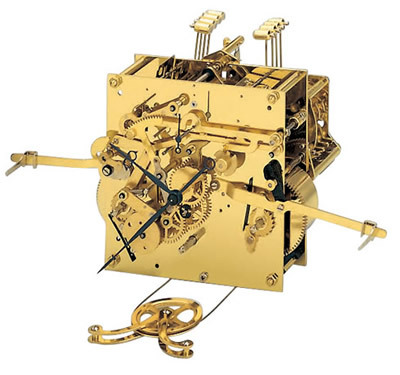 The Kieninger APL 05, Westminster melody, 43cm pendulum movement as shown but without hands. 4/4 key wind movement with dead beat escapement, Westminster chime on 5-rod gong and automatic night time shut-off between 10.00 PM and 7.15 AM. Click here to view the APL 43cm movement Options and Prices page. 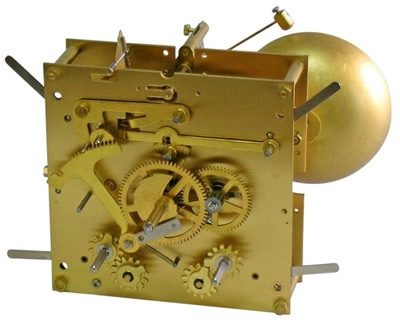 The Kieninger APL 05, Westminster melody, 48cm pendulum movement as shown but without hands. 4/4 key wind movement with dead beat escapement, Westminster chime on 5-rod gong and automatic night time shut-off between 10.00 PM and 7.15 AM. Click here to view the APL 48cm movement Options and Prices page. 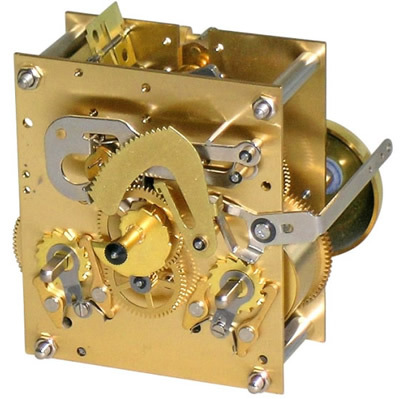 The Kieninger APL 07, Westminster melody, 54cm pendulum movement as shown but without hands. 4/4 key wind movement with dead beat escapement, Westminster chime on 5-rod gong and automatic night time shut-off between 10.00 PM and 7.15 AM. Click here to view the APL 54cm movement Options and Prices page. 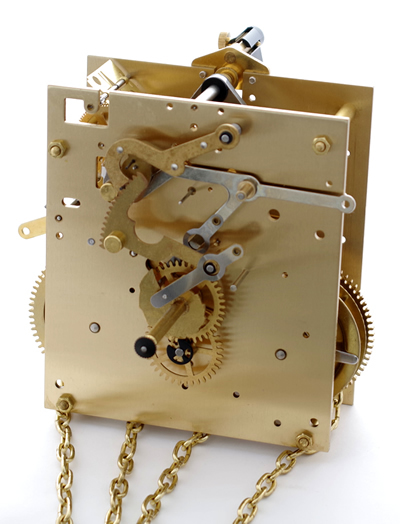 The Kieninger APL 01, Westminster melody, 65cm pendulum movement as shown but without hands. 4/4 key wind movement with dead beat escapement, Westminster chime on 5-rod gong and automatic night time shut-off between 10.00 PM and 7.15 AM. Click here to view the APL 65cm movement Options and Prices page. The Kieninger PS 055 - 65cm pendulum movement supplied as shown but without hands. Plate size 114mm x 99mm x 2.0mm. A Graham dead-beat escapement, Automatic tick (beat) adjustment. Automatic night silencing (manual night silencing with Regulator mechanism) - a lever allows you to select Automatic Night Silencing (10PM until 7-15AM), Continuous Chiming or Silent. The PS movement chimes the hours and strikes on the half-hour on a round gong. Click here to view the PS 055 movement Options and Prices page. We have several previously owned PS movements which have now been serviced at Oakside and offered with a 12 month parts warantee. 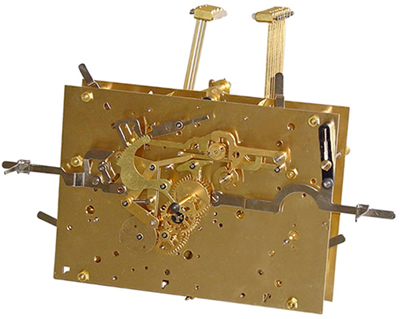 The Kieninger PS 055 - 65cm VIENNA pendulum movement supplied as shown but without hands. We can offer these movements as part of Set 12. Click here to view the PS 055 movement - Previously Owned Options and Prices page. The Kieninger SKU06 1/4 chain movement with triple chime (Westminster, St. Michael and Whittington) on 12-rod gong (back hammer), run time 7 days, plate size 120 x 124 x 1,7 mm Kieniramic7 solid anchor with stationary escapement (Graham) and automatic beat adjustment, chime shut-off and automatic night time shut-off between 10.00 PM and 7.15 AM. Click here to view the SKU 06 movement Options and Prices page. The Kieninger RWS 13 - 65cm cable movement as shown but without hands. The movement specifications. Plate size 131mm x 131mm x 2.0mm. A Dead-beat Graham escapement, Automatic tick (beat) adjustment. Automatic night silencing - a lever allows you to select Automatic Night Silencing (10PM until 7-15AM), Continuous Chiming or Silent. The RWS movement chimes the hours and plays the Westminster melody on the quarters, on an 8-rod gong. Click here to view the RWS 13 movement Options and Prices page. The PK movement specifications. Plate size 114mm x 99mm x 2.0mm with 4 bronze bushes. the patented Kienirramic& solid anchor Dead Beat Graham escapement, Automatic tick (beat adjustment, Automatic Night Silencing. The movement chimes the hours and strikes a single chime on the half hour. Click here to view the PK 154 movement Options and Prices page. The Kieninger RWS 25 - 80cm cable movement as shown but without hands. 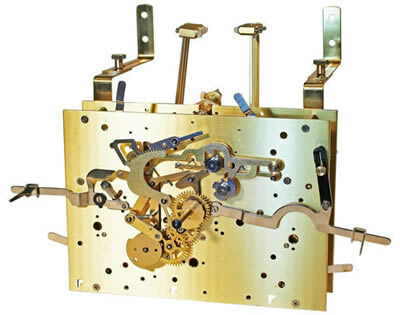 Click here to view the RWS 23 movement Options and Prices page. 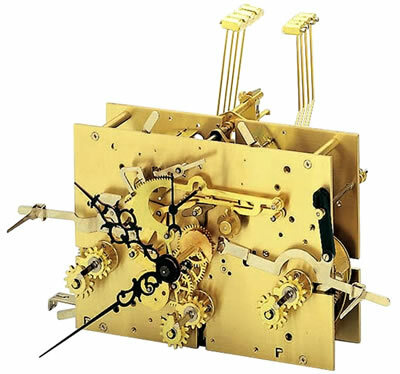 The Kieninger KSU 38, Triple Melody, 93cm pendulum movement as shown but without hands. The KSU 38, 93cm Pendulum Movement specifications. Plate size 141mm x 200mm x 2.5mm´. 6 bronze bushes, Triple chiming - Westminster, Whittington & St Michaels melodies, Dead beat Graham escapement, Maintaining power, Automatic Tick (beat) adjustment, Maltese cross, cable winding stops to prevent over-winding, Separate controls for Chimes and he Melodies - The control that protrudes through the left slot in the dial allows selection of - Silent, Automatic silencing between 10pm to 7-15am or Continuous chiming. The control that protrudes through the slot on the right side of the dial allows selection of the three melodies and Silent - The Hourly chimes and the melodies are played on a 12-rod gong. Click here to view the KSU 38 movement Options and Prices page. 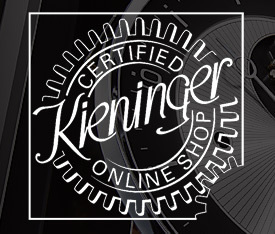 The Kieninger RK 046 - 93cm Westminster movement. The RK 046 movement specifications. Plate size 131mm x 131mm x 2.0mm´. Six bronze bushings, Kieniramic7 Dead-beat Graham escapement, Automatic tick (beat) adjustment. A lever allows you to select Automatic Night Silencing (10PM until 7-15AM), Continuous Chiming or Silent. The Kieninger RK 046 - handshaft protrusion 35.8mm. The RK movement chimes the hours and plays the Westminster, melody, on the quarters on an 8-rod gong (not included). Click here to view the RK 046 movement Options and Prices page. 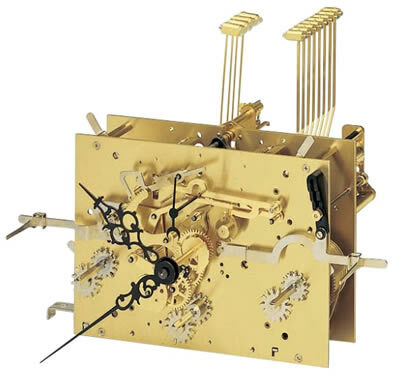 The Kieninger KSU 36, Triple Melody, 100cm pendulum movement as shown but without hands. The KSU 36, 100cm Pendulum Movement specifications. Plate size 141mm x 200mm x 2.5mm´. 6 bronze bushes, Triple chiming - Westminster, Whittington & St Michaels melodies, Dead beat Graham escapement, Maintaining power, Automatic Tick (beat) adjustment, Maltese cross, cable winding stops to prevent over-winding, Separate controls for Chimes and he Melodies - The control that protrudes through the left slot in the dial allows selection of - Silent, Automatic silencing between 10pm to 7-15am or Continuous chiming. The control that protrudes through the slot on the right side of the dial allows selection of the three melodies and Silent - The Hourly chimes and the melodies are played on a 12-rod gong. Click here to view the KSU 36 movement Options and Prices page. 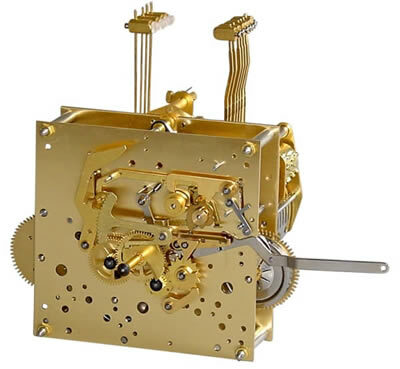 The Kieninger RS 005 - 116cm pendulum movement with Westminster chime on an 8-rod gong. The movement specifications. Plate size 131mm x 131mm x 2.0mm. A Dead-beat Graham escapement, Power Reserve, Automatic tick (beat) adjustment. Automatic night silencing - a lever allows you to select Automatic Night Silencing (10PM until 7-15AM), Continuous Chiming or Silent. The RWS movement chimes the hours and plays the Westminster melody on the quarters, on an 8-rod gong. Click here to view the RS 001 movement Options and Prices page. Click here to view the KK 025 movement Options and Prices page. The Kieninger KKU movement. 1/4 chain movement, triple chime (Westminster, St. Michael and Whittington) on 12-rod gong, run time 7 days, plate size 142 x 200 x 2,5 mm, 6 bronze bushings (2nd wheels), pallet anchor with stationary escapement (Graham) and automatic beat adjustment, true second, separate chime shut-off for hour and melody with weight drop and automatic night time shut-off between 10.00 PM and 7.15 AM, integrated dial lock lever. 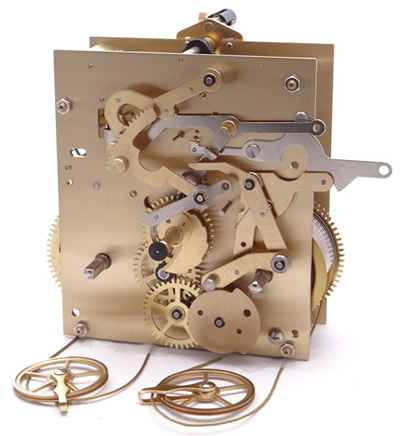 Click here to view the KKU 26 movement Options and Prices page. The Kieninger MSU 09, 16cm Triple Melody (Westminster, St. Michael and Whittington) on 12-rod gong, run time 8 days. Plate size 142 x 200 x 2,0 mm, Kieniramic7 solid anchor with dead-beat escapement (Graham) and automatic beat adjustment, true second, cable winding stops. Chime shut-off and automatic night time shut-off between 10.00 PM and 7.15 AM, integrated dial lock lever. Click here to view the MSU 09 movement Options and Prices page. 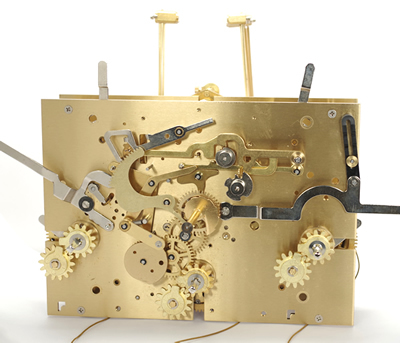 The Kieninger MK 003 116cm Westminster chime on 8-rod gong, run time 7 days, plate size 142 x 200 x 2,0 mm, Kieniramic7 solid anchor with stationary escapement (Graham) and automatic beat adjustment, cable winding stops, true second, chime shut-off and automatic night time shut-off between 10.00 PM and 7.15 AM, integrated dial lock lever. Click here to view the MK 003 movement Options and Prices page. Part 40 -- Kieninger MS 008 movement. The Kieninger MS 008 116cm Westminster, pendulum movement as shown but without hands. The MS movement chimes the hours and plays the Westminster chimes on the quarters. Click here to view the MS 008 movement. Options and Prices page. Click here to view the HE 116cm movement Options and Prices page. The Kieninger RK 047 - 116cm pendulum, Westminster movement. The Kieninger RK 047 - handshaft protrusion 47.8mm. Click here to view the RK 047 movement Options and Prices page. The Kieninger SK 012 - Westminster 116cm pendulum movement as shown but without hands. The SK 116cm Pendulum Movement specifications. Plate size 120mm x 124mm x 1.7, 6 bronze bushes, a Kieniramic7 Dead beat Graham escapement, Automatic Tick (beat) adjustment, Control for Silent, Automatic Night silencing 10pm to 7-15am or Continuous chiming. The Hourly chimes and the Westminster melody are played on a 8-rod gong. Click here to view the SK 012 movement Options and Prices page. 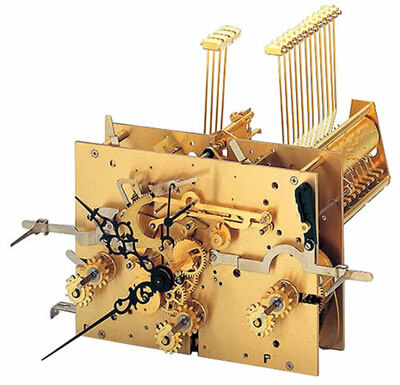 The Kieninger MKU, 116cm Triple Melody, pendulum movement as shown but without hands. The MKU 01 movement chimes the hours and plays three melodies - Westminster, Whittington & St. Michael on the quarters. Click here to view the MKU 01 movement Options and Prices page. 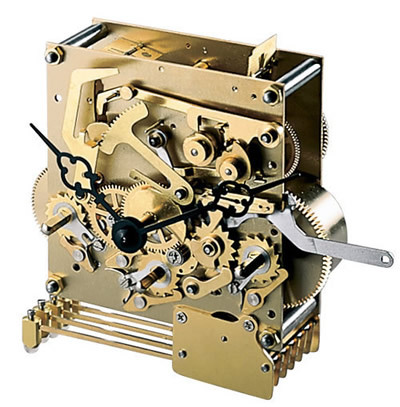 The Kieninger KSU 57 - Westminster melody, 116 cm pendulum movement as shown but without hands. The KS057 Strikes the hours and plays the Westminster Chime on the quarters, on an 8-rod gong. Click here to view the KS 057 movement Options and Prices page. 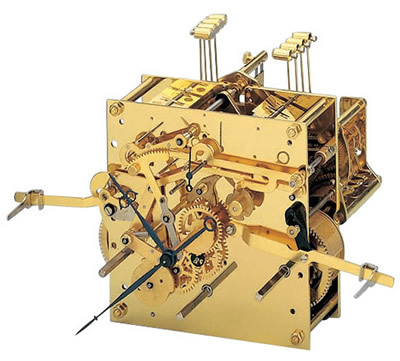 The Kieninger KSU 33, 116cm Triple Melody, pendulum movement as shown but without hands. The KSU 33 movement chimes the hours and plays three melodies - Westminster, Whittington & St. Michael on the quarters. Click here to view the KSU 33 movement Options and Prices page. 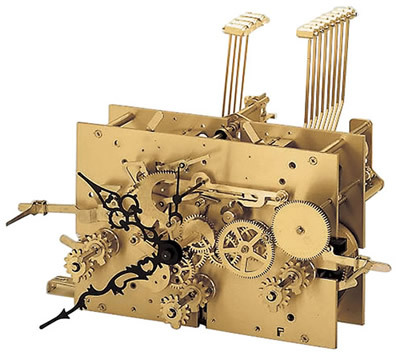 The Kieninger KSU 50, 116cm Triple Melody, pendulum movement as shown but without hands. Click here to view the KSU 50 movement Options and Prices page. 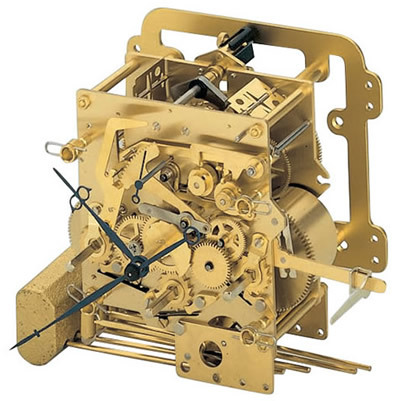 The Kieninger KSU 63, 116cm Triple Melody, pendulum movement as shown but without hands. Click here to view the KSU 63 movement Options and Prices page.